Leading up to the launch I was more excited than I thought possible. But today, mostly my feelings are swirling around like toilet water into a sewer of embarrassment and shame. I’m worried everyone will hate it. But don’t worry. It’s not all bad. Humility is a good thing. I should remember that. The podcast won’t be perfect and neither will I. Duh. That’s even IN THE TITLE. It’s funny—in the non-giggly sort of funny—how insidious feelings of inadequacy can be. Yep. They pop up like popcorn. Once they start, it’s hard to turn down the heat. 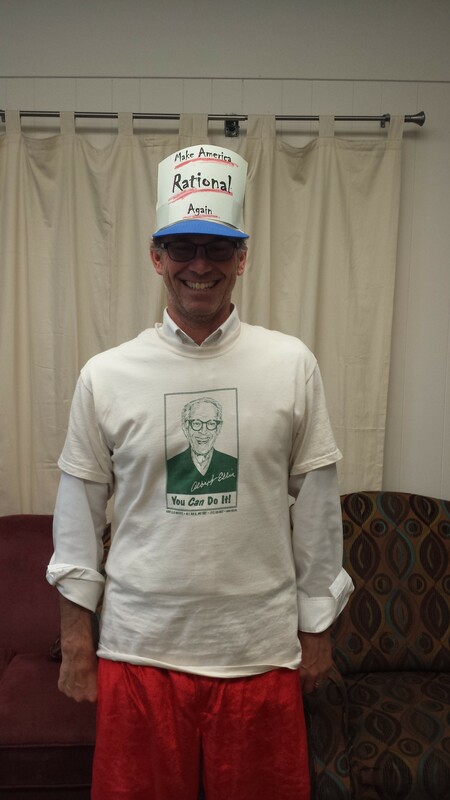 The good news is today I’ve dressed as Albert Ellis for Halloween. In case you don’t recall, Dr. Ellis invented “shame attacking” exercises. These involve exposing yourself directly to situations (activating events) that might trigger embarrassment or shame. His position was that if you do this, you’ll survive, and in the process prove to yourself that it’s okay to let go of the real triggers for shame: Your underlying irrational beliefs and thoughts. So today I’m facing my Theories class, dressed in Christmas shorts, and will lead them in singing a couple of Albert Ellis Holiday Carols. At the same time, I’ll be embracing all reactions to the Practically Perfect Parenting Podcast, recognizing that some listeners will love the podcast, while others will hate it and possibly share their negative feelings with me. And, like Ellis said, I will survive. Fortunately, my friend, colleague, and cohost, Dr. Sara Polanchek sometimes disagrees with me right in the middle of the podcasts. That’s a good shame-attacking thing that happens on a regular basis. It has already been proven that I can experience disagreement and live on. In the end, the point of these Practically Perfect Parenting Podcasts isn’t for Sara and I to be wise and right all the time anyway. Parenting well is immensely challenging. No one is perfect. The point is to engage parents and parenting educators in ways that inspire reflection and intentionality. We believe there’s no such thing as a perfect parent. Instead, we believe in practically perfect parents. Our definition: parents who humbly accept their imperfections, develop self-awareness, love their children, and who are open to learning how to be and become a better parent every day, over and over. That’s nothing to be ashamed about. I think that was an AWESOME intro……way to go, Albert!